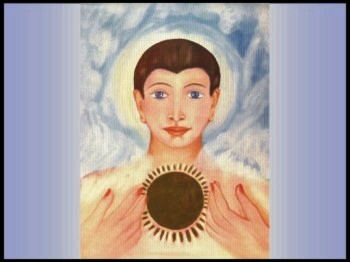 The pale whitish blue light is "Sri Aurobindo's Light" — it is the blue light modified by the white light of the Mother. A whitish blue like moonlight is known as Krishna's light or Sri Aurobindo's light. The white-blue light (two separate colours) may be that of the Mother's consciousness in the higher mind. The feeling you had in the afternoon of the cessation of thought and the sensation of something within you going up above the head is part of the movement of the sadhana. There is a higher consciousness above you, not in the body, so above the head which we call the higher spiritual or divine consciousness or the Mother's consciousness. When the being opens then all in you, the mind (head), emotional being (heart), vital, even something in the physical consciousness begin to ascend in order to join themselves to this greater higher consciousness. One has when one sits with eyes closed in meditation the sensation of going up which you describe, it is called the ascension of the lower consciousness. Afterwards things begin to descend from above, peace, joy, light, strength, knowledge etc. and a great change begins in the nature. This is what we call the descent of the higher (The Mother's) consciousness.